Fever and epilepsy. When it comes to epilepsy and fever, either Febrile Seizures or Dravet Syndrome are usually the most prominent topics on our blog. However, in addition to these syndromes, there various other epilepsies that have fever-related seizures as a prominent feature. In a recent publication in Epilepsia, we investigated the role of microdeletions in a group of patients with prominent fever-associated epilepsies. Our findings suggest that fever-associated epilepsy syndromes may be a presentation of known microdeletion syndromes. Overview of the 8/36 (22.2%) patients in our study by Hartmann and collaborators, which carried rare copy number variations (CNVs). In 4/36 patients, these CNVs were classified as pathogenic (marked in yellow). SCN1A negative. Dravet Syndrome is a severe epilepsy syndrome with prominent fever-related seizures. More than 80% of patients with Dravet Syndrome have mutations in SCN1A. 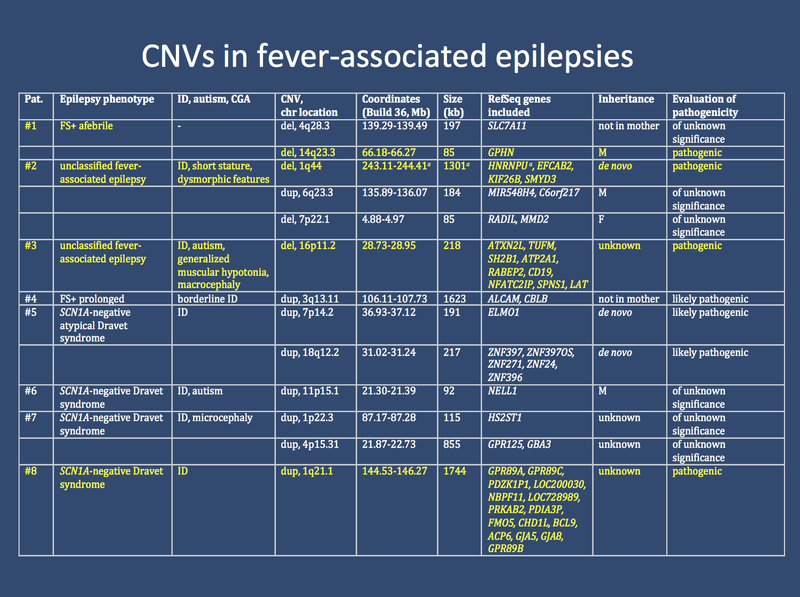 Furthermore, SCN1A mutations can also be found as a very prominent cause in patients with other fever-associated epilepsies, ranging from milder Febrile Seizures Plus phenotypes to severe epileptic encephalopathies. However, there are other epilepsies with fever-associated seizures that do not really fit this spectrum. In our recent study, with Corinna Hartmann as the lead author, we tried to collect a group of patients who were SCN1A-negative and had one common phenotypic feature: a prominent susceptibility to seizures with fever. Copy Numbers Variations. We were able to ascertain a group of 36 patients, and the break-down of the phenotypes were as follows: SCN1A-negative Dravet syndrome with typical (n=13) and atypical presentations (n=10), GEFS+/FS+ (n=11), and unclassified fever-associated epilepsies (n=2). In addition to the epilepsy diagnosis, roughly 20% of patients had additional syndromic features such as congenital malformations, suggesting a genetic causation of the disease. In our study, we performed copy number variation (CNV) analysis in this cohort of patients with fever-associated syndromic epilepsies. Recurrent microdeletions. Interestingly, in 4/36 (11.1%) patients we identified previously described microdeletion syndromes. In a patient with Febrile Seizures Plus (FS+), we identified an inherited deletion in GPHN coding for gephyrin. Deletions affecting this gene are increasingly recognized as genetic risk factor for various neurodevelopmental disorders. In a patient with unclassified fever-associated epilepsy, intellectual disability, short stature and dysmorphic features, we found a 1q44 deletion disrupting the HNRNPU gene. In addition, we found a 16p11.2 deletion in a patient with unclassified fever-associated epilepsy, autism, generalized muscular hypotonia and macrocephaly. Finally, we discovered a 1q21.1 duplication in a patient with SCN1A-negative Dravet syndrome. All four examples are previously known regions for neurodevelopmental syndromes. We were surprised that these conditions may also present with fever-associated seizures as the most impressive clinical feature. What you need to know. Seizures with prominent tendency to occur with fever are always suggestive of an underlying SCN1A mutation. However, albeit much less frequently, similar features may also occur in many neurodevelopmental disorders such as microdeletion syndromes, which are known to have a broad phenotypic range. This finding may suggest that the underlying mechanisms that predispose individuals to a strong sensitivity to seizures with fever may be shared across a wide range of genetic conditions. Given that we are only beginning to understand the mechanisms behind Dravet Syndrome, this observation may help pinpoint key mechanisms of this phenomenon. This entry was posted in 2014, Bioinformatics, Papers and tagged 16p11.2, Dravet Syndrome, Dravet-like epilepsies, febrile convulsions, febrile seizures, fever-associated epilepsy, FS+, GABRA1, GEFS+, PRRT2, SCN1A, SEZ6, STXBP1. Bookmark the permalink.